Whether you live in the snow belt or the sunny south, the winter season often means a change in the weather. In many places, the sun isn't as strong and cooler temperatures bring relief from the summer's heat. 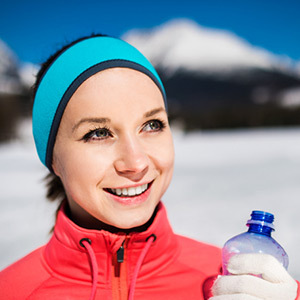 Yet even though it may be chillier outside, your body's need for hydration is the same as it was in the summer—and a lack of proper hydration can be bad news for your oral hygiene. Everyone knows we need to drink plenty of water every day to stay healthy. It's important for good oral hygiene because water is the major component of saliva, which fights bacteria and helps neutralize the acids that cause tooth decay. Water also keeps the soft tissues of the mouth moist and healthy, and helps fight bad breath. In many communities tap water is fluoridated, which offers proven protection against cavities. But in the middle of winter, fewer people carry around bottles of cold water for refreshment—and that's a shame, because we need it just as much! While indoor (and outdoor) air is often drier in winter, your body continues to lose water in the same ways. And if you keep up a healthy exercise routine (like jogging, snow sports or backyard fun and games), you still need plenty of hydration. An ice-cold glass of water may not be as appealing in January as in July…but it's just as important. Of course, the water you drink doesn't have to be freezing cold to do its job. Hot tea (especially herbal tea) can be a healthy option for wintertime hydration. So is plain water without ice. Fruits and vegetables also contain lots of water, plus vitamins, fiber, and many more substances that are good for your body. But there are some drinks you should avoid—or at least take in moderation. Regularly drinking coffee and tea can stain your teeth, and excessive caffeine may have negative health effects. Consuming alcoholic beverages can cause dry mouth, and may increase the risk of oral cancers. And, of course, drinks that contain sugar (including soda, some juices, and many coffee and hot chocolate beverages) are linked not only to tooth decay, but to other health problems as well. And whatever the season, don't forget to come in to the dental office for regular checkups and cleanings. We can remove the sticky tartar that clings to your teeth and may cause tooth decay and other problems. We will also perform a complete dental exam, evaluate your oral health and help resolve small problems before they turn into big headaches (or toothaches). Working together, we can help you enjoy the benefits of good oral hygiene all though the year. Around 20 million people—mostly women after menopause—take medication to slow the progress of osteoporosis, a debilitating disease that weakens bones. 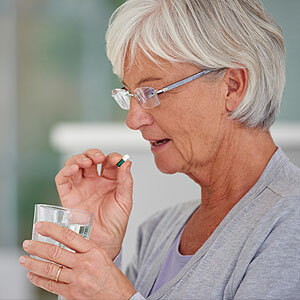 But although effective, some osteoporosis drugs could pose dental issues related to the jawbones. Osteoporosis causes the natural spaces that lie between the mineral content of bone to grow larger over time. This makes the bone weaker and unable to withstand forces it once could, which significantly increases the risk of fracture. A number of drugs have been developed over time that stop or slow this disease process. Two of the most prominent osteoporosis drugs are alendronate, known also by its trade name Fosamax, and denosumab or Prolia. While originating from different drug families, alendronate and denosumab work in a similar way by destroying specialized bone cells called osteoclasts that break down worn out bone and help dissolve it. By reducing the number of these cells, more of the older bone that would have been phased out lasts longer. In actuality this only offers a short-term benefit in controlling osteoporosis. The older bone isn’t renewed but only preserved, and will eventually become fragile and more prone to fracture. After several years the tide turns negatively for the bone’s overall health. It’s also possible, although rare, that the bone simply dies in a condition called osteonecrosis. The jawbones are especially susceptible to osteonecrosis. Forces generated by chewing normally help stimulate jawbone growth, but the medications in question can inhibit that stimulus. As a result the jawbone can diminish and weaken, making eventual tooth loss a real possibility. Osteonecrosis is most often triggered by trauma or invasive dental procedures like tooth extractions or oral surgery. For this reason if you’re taking either alendronate and denosumab and are about to undergo a dental procedure other than routine cleaning, filling or crown-work, you should speak to your physician about suspending your medication temporarily. 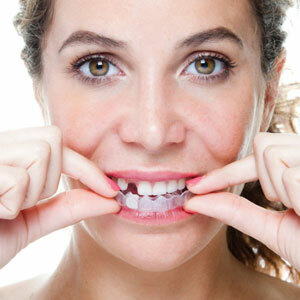 Dentists often recommend a suspension of three to nine months before the procedure and three months afterward. Some research indicates this won’t worsen your osteoporosis symptoms, especially if you substitute another treatment or fortify your skeletal system with calcium and vitamin D supplements. But taking this temporary measure could help protect your teeth in the long run.